RIYADH, 25th December, 2018 (WAM) -- The Joint Incident Assessment Team (JIAT) of the Arab Coalition to Restore Legitimacy to Yemen affirmed today the conformity of their military operations with the principles of the Customary International Humanitarian Law. 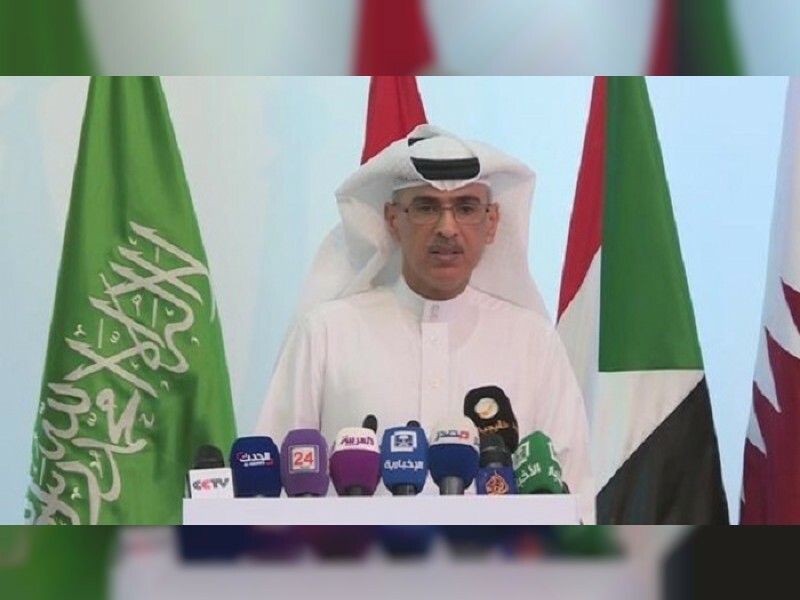 The spokesman for JIAT, Legal Counsellor Mansour Al-Mansour, held a press conference here today, where he refuted five allegations reported by international organisations and international media organs, and affirmed the safety of all procedures followed by the Coalition Forces, according to the Saudi Press Agency. Regarding the allegation that Coalition Forces has targeted Fish Wealth Headquarters in Port Khobah, Hodeidah, Al-Mansour said that, reagrding case No. 112, different media outlets had circulated that the Coalition Air Force on Monday, January 8th, 2018 conducted four consecutive airstrikes against the Fish Wealth Headquarters and a fishing gear warehouse in Port Khobah, Al Luhayyah Directorate, Hodeidah Governorate West of (Yemen), which caused the death of five people and injury of another five. He added that JIAT has vetted the possibility of the incident, and following verification of all related documents; including the procedures and rules of engagement, daily mission schedule, post-mission reports, video recordings of the missions, satellite imagery and evidence evaluation, it was clear to the Team that the Fish Wealth Headquarters, called "The Old Ice Factory", is located in Port Khobah, Al Luhayyah Directorate, Hodeidah Governorate. And that on Sunday, January 7th, 2018 credible intelligence sources confirmed the presence of a specific number of Yemeni Navy engineer officers loyal to the Houthi Militia, supported by foreign experts, at "The Old Ice Factory", working on preparation of a guided-missile and RC Exploding Boats, including a white boat to threaten maritime navigation and coalition vessels in the Red Sea. Thereby, considered a legitimate military target that fulfilled the "verification" standards through "credible intelligence" in accordance with the International Humanitarian Law, to be used by armed Houthi militia in support of their war effort. Hence, and based on the inherent right of self-defense, guaranteed by the International Law, and in protection of Maritime Navigation and Coalition Vessels in the Red Sea, on Monday, January 8th, 2018, the Coalition Air Force conducted a targeting mission aimed at "The Old Ice Factory", in Port Khobah, where the presence of a specific number of Yemeni Navy engineer officers loyal to the Houthi Militia, supported by foreign experts, was confirmed, who were working on preparation of a guided-missile and RC Exploding Boats to threaten Maritime Navigation and Coalition Vessels in the Red Sea. Al-Mansour affirmed that JIAT has reviewed satellite imagery of the operation, Post-Mission Reports as well as video recordings of the mission that indicate the destruction of the target "The Old Ice Factory". Video recordings have indicated that the area of the target was civilian and civilian-vehicle free at the time of the operation, and that a hanger adjacent to the target had sustained partial damage, due to a secondary explosion as a result of the targeting. "On the light of that; JIAT confirms the validity of the Coalition Air Force procedures in targeting the Fish Wealth Headquarters called "The Old Ice Factory", and that they were carried out in accordance with the Customary International Humanitarian Law. JIAT as well deems fit that Coalition States provide voluntary assistance as a result of the collateral damage sustained by the hanger adjacent to the military target "The Old Ice Factory" in Port Khobah," Legal Counsellor Mansour Al-Mansour said. Regarding the case No. 113, Al-Mansour said that the Amnesty International report issued August 18th, 2015 stated that: On 14 April 2015 at approximately 12.30 am, a coalition airstrike killed ten civilians, including seven children and two women, and injured 14 others in Al-Akma village. The airstrike struck a residential area of the village where members of the marginalised community live in dwellings made of corrugated iron and cardboard. Al-Akma Village, 20km north-east of the city of Ta’iz, falls between two Huthi/Saleh loyalist-controlled military installations, both belonging to 22 May Brigade, around 500m to one kilometer from the east and west of the village." He added that the Joint Incidents Assessment Team has vetted the possibility of the incident, and following verification of all related documents; including the procedures and rules of engagement, daily mission schedule, post-mission reports, satellite imagery and evidence evaluation, JIAT found that Al Akma village is located in Ibb Governorate (20) kilometers due North of Ta’iz City. Following a review of the Coalition Air Force’s DMS on the day of the allegation Tuesday, April 14th, 2015), JIAT confirms that the Coalition Air Forces did not conduct any aerial missions on Al-Akma village on the given date. JIAT, as well, reviewed the Coalition Air Force’s DMS a day pre the allegation date, Monday, April 13th, 2015. The Coalition Air Force DID NOT conduct any aerial missions neither in Ibb Governorate nor Ta’iz Governorate. JIAT, furthermore, reviewed the Coalition Air Force’s DMS a day post the allegation date, (Wednesday, April 15th, 2015). JIAT found that the Coalition Air Force conducted a single aerial mission in Ta’iz Governorate, and that the target of said mission was twelve kilometers away from Al-Akma village. Following review of satellite imagery post allegation date, Al-Akma village had not sustained airstrike damage. On the light of that, JIAT finds that the Coalition Air Force did not target a residential area in Al-Akma village, Ibb Governorate. With regards to case No. 114, the International Committee of the Red Cross (ICRC) Middle East delegation stated in their report that on March 15th, 2017 at 2000, a Coalition helicopter struck two fishing boats 24 nautical miles away from Port Hodeidah, which resulted in the killing of seven people, and injuring of eight more. The panel of experts report (S/2018/68) dated January 26th,2018 stated that on March 16th, 2017 in a location North of Hodeidah Port, 10 fishermen went missing, with the remains of their boat found burnt in close proximity to Eritrean waters. The JIAT Spokesman said that the Joint Incidents Assessment Team has vetted the possibility of the incident, and following verification of all related documents; including the procedures and Rules of Engagement for Coalition Air Force and Navy, Coalition Air Force Daily Mission Schedule, Coalition Navy Vessel Inspection Procedures, Navy Vessel Supply and Logistics Records for Vessels in South of the Red Sea on the date of the allegation, statements by Vessel Captains in the Area of Operations on the date of the allegation and statements by the aircrew of a helicopter dispatched to a Coalition Vessel. And following review of Coalition Vessels disposition map, and whereabouts in the Area of Operations, threat sources on the date of the allegation and what was mentioned on security investigations records, in a chronological analysis of operational and intelligence events on Wednesday and Thursday, March 15th and 16th, 2017, JIAT discovered: 1- On Wednesday March 15th, 2017, Coalition Forces did not engage any surface targets in the Red Sea; 2- On Thursday March 16th, 2017, the following events were confirmed: A. At 06:30, 131 nautical miles away from Port Hodeidah, a Coalition Vessel went through an attempted attack, where a boat carrying five people was monitored approaching it. After posing an immediate threat to the Vessel, three warning shots were fired. Subsequently, the boat turned around, and the Vessel never dealt with it again. B. At 18:00, with surveillance of the Area of Operations, 90 nautical miles West of Port Hodeidah, the same Vessel the detected multiple unknown boats anchored surrounding a suspicious ship in the Area of Operations. The presence of said boats was confirmed by some Coalition Vessels in the same location at the time. C. At (20:45), 121 nautical miles away from Port Hodeidah, the same vessel was under an attempted attack in its Area of Operations by two boats sailing directly toward it. After they reached an immediate threat distance, the Vessel engaged the boats according to the Coalition Rules of Engagement and fired warning shots. Nevertheless, the boats did not heed the warning, and continued toward the Vessel. After reaching a distance of imminent danger to the Vessel, the closest boat, boarded by nine people, was targeted with light-weapon rounds to neutralize it, based on the inherent right of self-defense in accordance with International Law, and the other boat turned away and was not targeted. The Vessel conducted a search and rescue mission for the people onboard the targeted boat. Eight of them were rescued and the ninth was not to be found. Survivors were then transported to a medical facility to receive treatment according to the Coalition’s Rules of Engagement, which are in accordance with the Customary International Humanitarian Law. He added that the JIAT, as well, reviewed the security investigations’ report of the ones rescued, where they acknowledged their affiliation with the armed Houthi militia, and that their close proximity to the Vessel was for military purposes including; monitoring and tracking Coalition Vessels, determining locations of Vessels and distances at which the Vessels engage incoming boats. Al-Mansour said that, on the light of that, JIAT finds that Coalition Navy Force, exerting the inherent right of self-defense in accordance with the International Humanitarian Law, targeted one boat through a Coalition Vessel, and not through a helicopter as stated in the allegation. Therefore, JIAT confirms the validity of the Coalition Navy Force procedures in targeting a boat, and that they were carried out in accordance with the Customary International Humanitarian Law. Regarding case No. 115, the JIAT official spokesman said that an e-mail by the Coordinator of the Panel of Experts on Yemen stated that a Coalition airstrike struck a house on May 9th, 2018 in Dahyan area, Majz Directorate, Saadah Governorate, which caused the killing of one woman and three children. He added that the Joint Incidents Assessment Team has vetted the possibility of the incident, and following verification of all related documents; including the procedures and rules of engagement, daily mission schedule, post-mission reports, satellite imagery, video recordings and evidence evaluation, JIAT found that the Coalition Forces had received intelligence indicating a building being used as command operations center and supply point for border fronts of the armed Houthi militia with weapons, ammunition and heat-seeking missiles in Alab – Al Rabow’ah 37 kilometers away from Saudi Arabian International Border. Deeming it a legitimate military target, whose destruction offers a definite military advantage. Accordingly, the Coalition Air Force on Wednesday May 9th, 2018, carried out a single targeting operation in Dahyan, Majz Directorate, Saadah Governorate, against the building using a single bomb that hit the target precisely. Following review of satellite imagery and video recordings, the surrounding buildings did not sustain any damage, and that Coalition Forces took all feasible precautions from type of munition used to the angle of the strike and vacancy of surrounding area of civilians and civilian vehicles, as well as making sure that the building was civilian-free at the time of the operation in accordance with the Customary International Humanitarian Law. On the light of that; he disclosed that JIAT confirms the procedures of the Coalition Forces in targeting the building in question), and that they were carried out in accordance with the Customary International Humanitarian Law. With regard to a case No. 116, he said that the "Annual Report of the United Nations High Commissioner for Human Rights" regarding Yemen, presented to the Human Rights Council on September 7th, 2015 stated: "OHCHR gathered information indicating that, on 7 June 2015, coalition forces conducted air strikes against an area hosting a high concentration of internally displaced persons in Duaij village, Hajjah Governorate, allegedly killing four civilians, including three women, and injuring 41 civilians, including12 women and 16 children. Four makeshift homes for displaced persons were allegedly destroyed in that incident." An addendum later explained that the airstrike occurred between 13:30-14-00, and according to eye witness statements presented to the High Commissioner, two Cluster bombs struck Duaij village, followed by a helicopter machine-gun assault ten minutes after the first attack. The coordinates of the location of the allegation were provided by the Office of the High Commissioner. The JIAT Spokesman said that the Joint Incidents Assessment Team has vetted the possibility of the incident, and following verification of all related documents; including the procedures and Rules of Engagement, Daily Mission Schedule of Air Force and Helicopters, After Mission Report, satellite imagery and evidence evaluation. JIAT found that on the day of the allegation, following fulfillment of degrees of verification through credible intelligence, a gathering of Houthi armed militants was detected in a militia camp in Hajjah Governorate, six kilometers away from the Saudi Arabian international border. On Sunday June 7th, 2015, at 12:30, the Coalition Air Force conducted a targeting operation against a camp where armed militants were detected in Hajjah Governorate, 14 kilometers away from the coordinate mentioned in the allegation, using a single precision-guided bomb that hit the target precisely, direct hit. JIAT also found, following review of Coalition Helicopter Mission Schedule that they had not conducted any aerial missions in the area of the allegation. After review and analysis of satellite imagery of the area of the location, JIAT found no airstrike damage in Duaij village, the area of allegation. Accordingly, he affirmed that JIAT confirms that the Coalition Air Force did not target Duaij village, Hairan Directorate, Hajjah Governorate.